Have you ever stumbled across something and just had to share it with everyone around you? That’s how I feel about water beads! 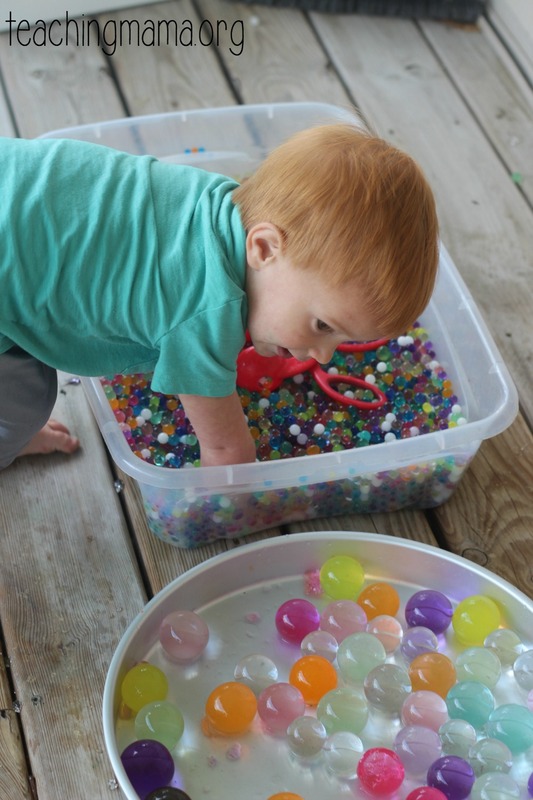 I tell all my friends with kids about using water beads for an amazing sensory play activity. They even are enjoyable for me to play with! 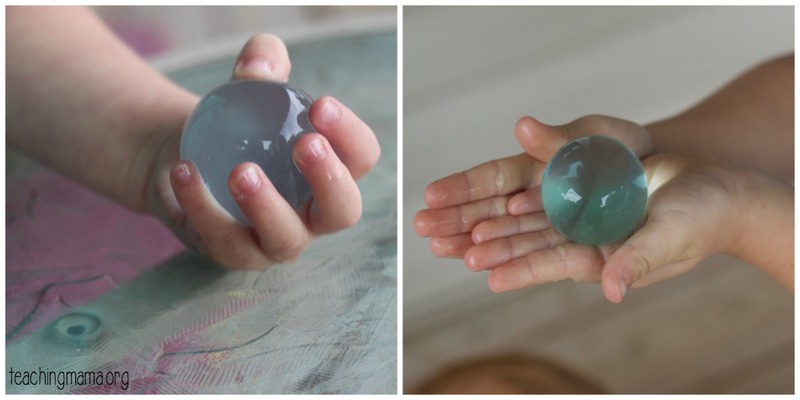 We’ve been playing with small water beads for years, but I just discovered Giant Water Beads!! These are fantastic and I can’t wait to share all about them with you! These beads are amazing to play with! They are just as fun as they look!! They are squishy, soft, silky, bouncy, and smooth. Yes, this is a super fun play activity, but it’s also great for learning. 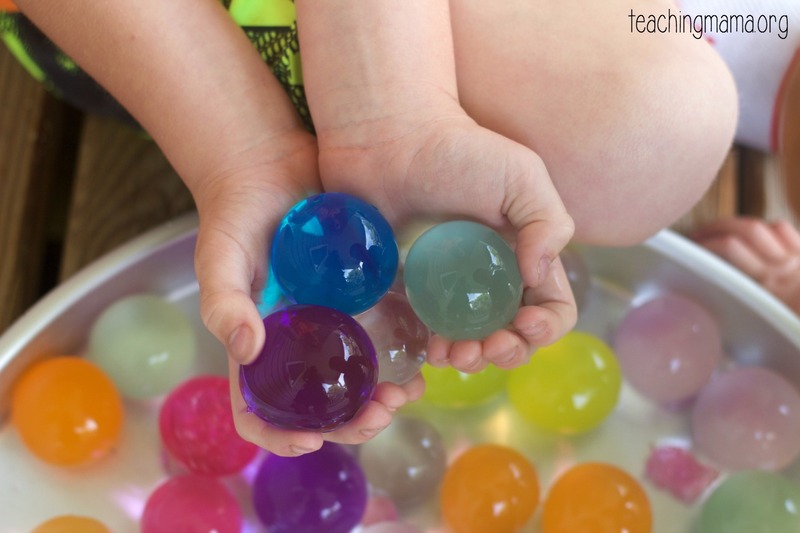 sensory attributes – teach little ones what squishy feels like! colors – practice naming colors as you play! cause and effect – as your child explores, they’ll notice if they drop the ball, it will bounce! Or if you throw it hard, it will break a part. social interaction skills – if you play with these in a group or with a sibling, children learn how to share and play together. Sounds simple, but activities like this is a great way to practice sharing and working together. You’re probably wondering HOW to make these awesome beads. 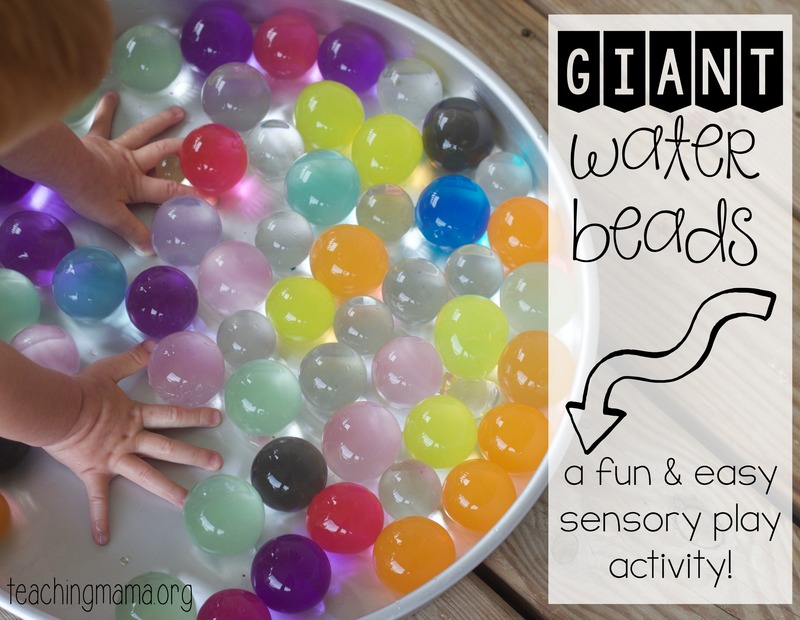 Well, all you need for this activity are large water beads and water. I have not found these in the store yet, only on Amazon. 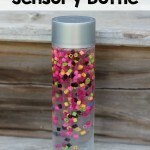 When you’re ready to make the beads, simply place the small beads into a container full of water. 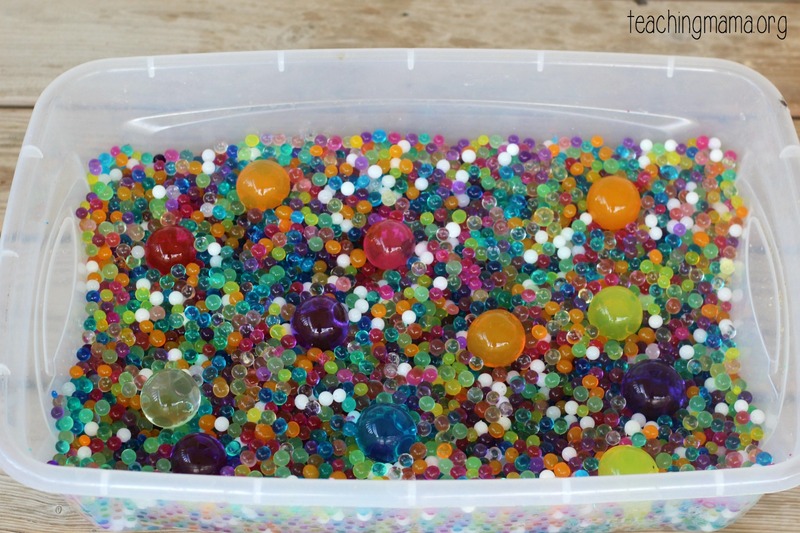 In the picture above, you’ll see small water beads mixed with large ones. This is what they look like when you begin the growing process. 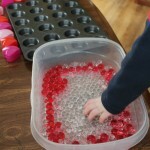 In about 30 hours, your water beads will enlarge to their fullest size! Don’t these look so inviting to play with?! I love that these giant water beads are not something that could fit inside of a child’s mouth. (If you have a child that likes to put items in his or her mouth, you know what I mean!) HOWEVER, these do break a part if you bounce them too hard or squeeze them too hard, so I do not recommend using these beads with children who put items in their mouths. These are not edible! And as always, supervise your children as they play. 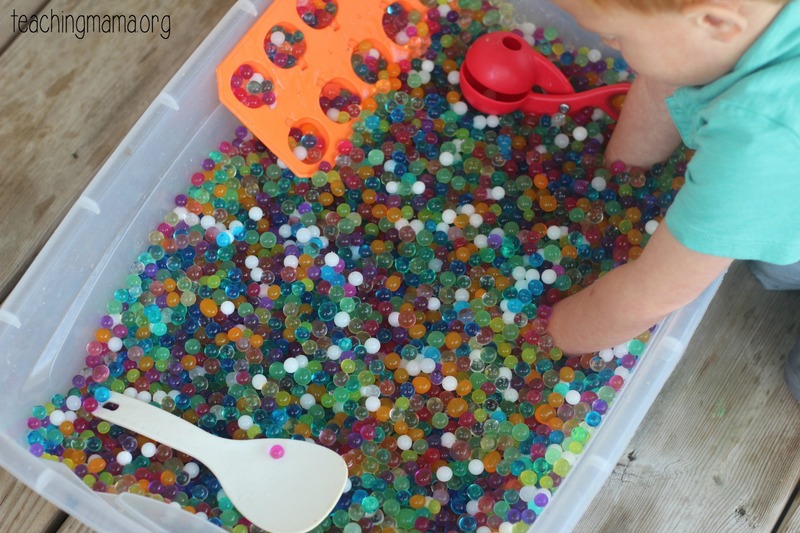 We also added a lot of small water beads to our bin and had lots of fun with both sizes! 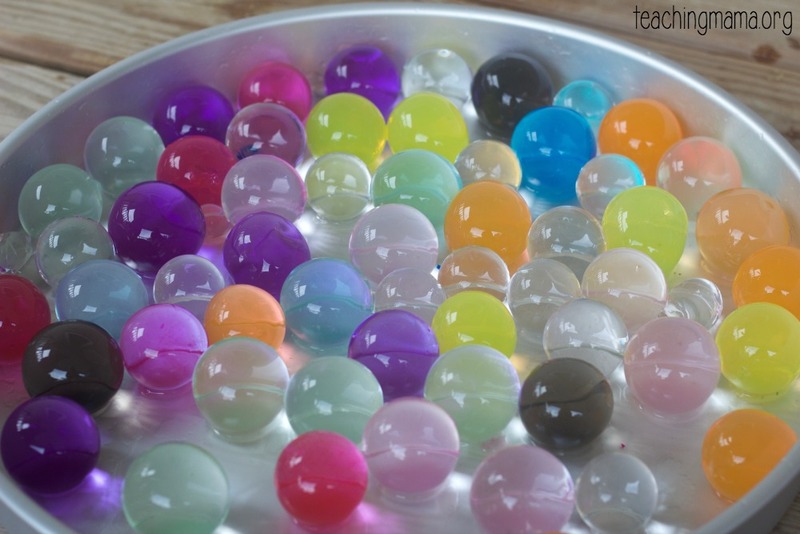 These water beads lead to HOURS of play for my kids. We scoop them, swirl our hands around, fill up buckets and dump them, smash some with toy hammers, sort them by colors, play with them in shaving cream, and more! 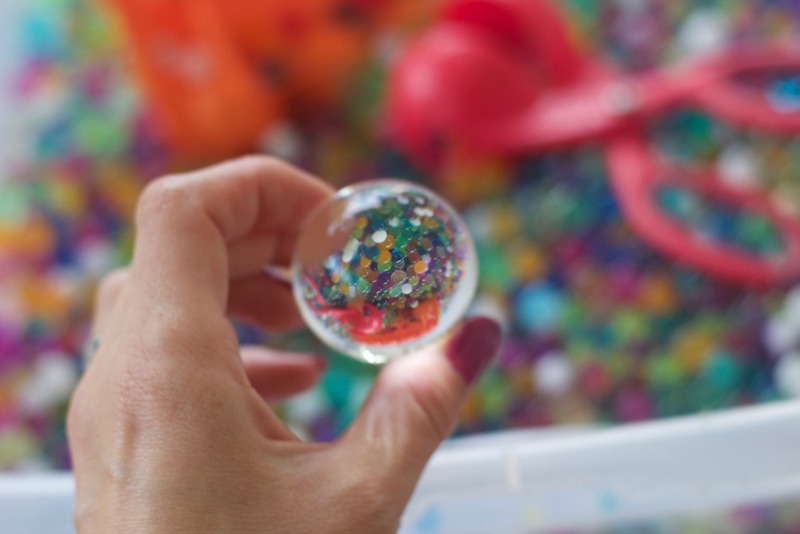 We also discovered that if you hold a clear bead close to the colorful bin, it looks really neat! 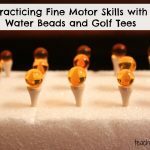 When you’re all done playing, you can let the water beads sit out until they dry out and shrivel back to their beginning size. 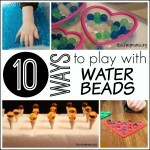 Then you can store them in a bag until you’re ready to make water beads again! I love that these are reusable! 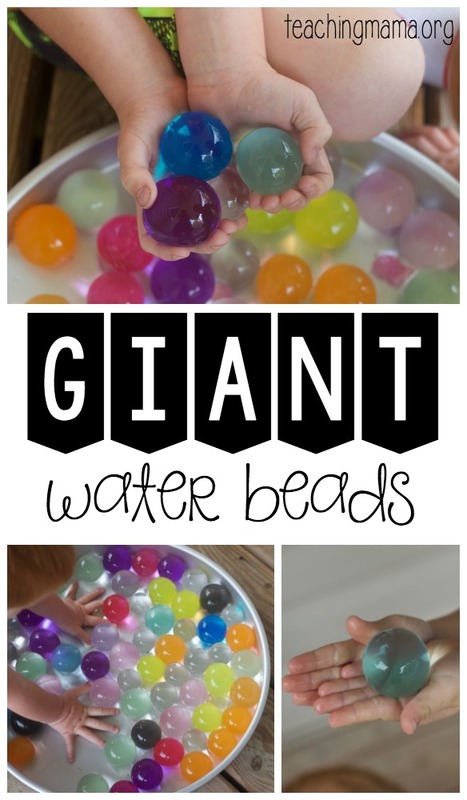 If you haven’t tried giant water beads, you MUST try it! 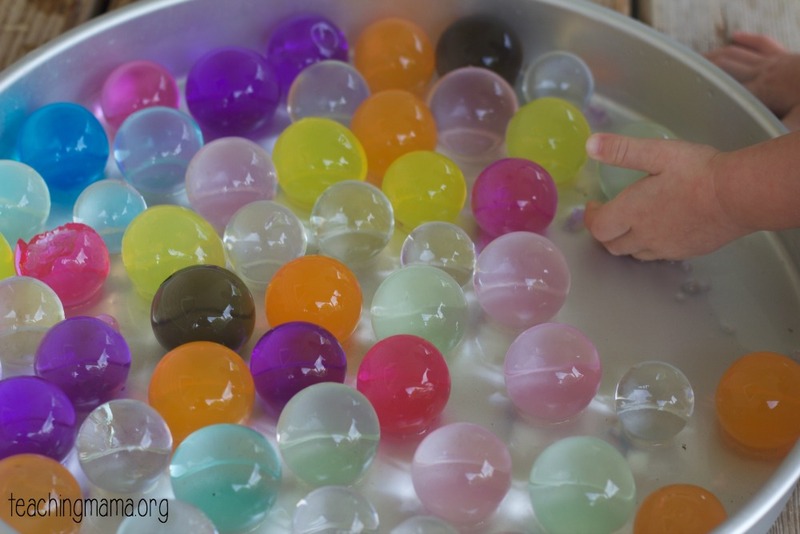 In my opinion, it’s the perfect sensory play activity for children! Let me know how you liked it! 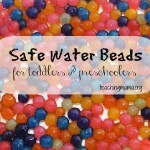 Do you have a link to the small water beads you used as well? This looks like a lot of fun to play with! I especially like that you said they’re reusable! Can you plz tell me so i could get the same size of this ball, as mine are much smaller in size then yours. Gutted not available in the UK!!! Also girls for an edible option you can pour liquid gelatine mixed with gel food colouring into water bomb balloons that are turned inside out! Do you know if there is any latex in these? I have a student with a latex allergy. According to wikipedia, and the ingredients in water beads are mostly water and polyacrylamide. Hope that helps! How do we go about to order these water beads. This looks like so much fun. How do you contain the mess though? Play outside? If we miss a few playing inside, do they leak onto the floor when shriveling up or do they evaporate? I either do them outside or put a tablecloth underneath our play area. Yes, if they lay on the floor or outside for a day or two, they do shrivel up. Then you can reuse them. Hope that helps! We have played a lot with the little ones….these are AWESOME!!! I highly recommend placing a handful in a bottle and setting a timer for 30 minutes when you add the water. My 2-year old was obsessed with observing the changes in the beads and had all sorts of nifty observations. I can’t wait to do the same thing with the large beads! Great find! That is such a wonderful idea!! Love it! 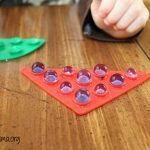 How do I store water beads to use later on? You can store them in a sealed plastic bag or in a closed container. It takes 30 hours for them to get to their big size? Yes it does. It’s fun to watch it grow! Very adventurous . I love to spend time doing this one with my nieces. 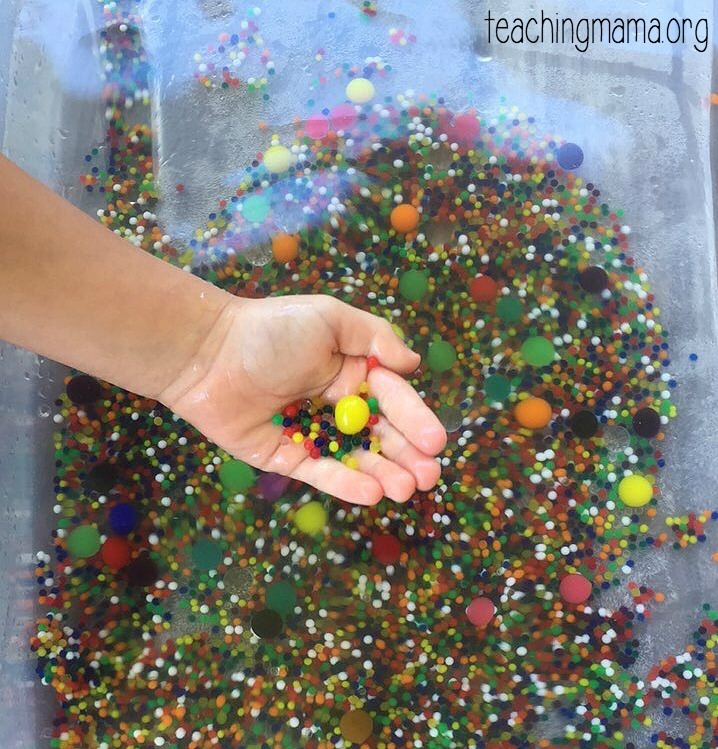 All my kids LOVE water beads! Even the ten-year-old asks to play with them. We store ours in an air-tight plastic container between playtimes. Love that they can be reused, it makes them a VERY cost effective play item considering the use they see! Awesome! They are so calming to play with. Thanks for sharing!